They are an unlikely set of musical stars. They live in a rural farming community on the Great Plains. They don't give concerts or use instrumental accompaniment. And they sing in a language that hasn't been spoken for centuries: Latin. What they have are rich, soaring voices and a sound full of solace. 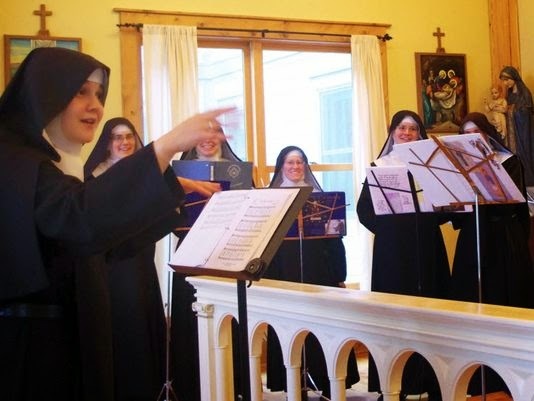 They are the Benedictine Sisters of Mary Queen of Apostles, a semi-cloistered, contemplative order of nuns from Gower, Mo., who are fueling a nationwide revival of interest in monastic music. The sisters have recorded three albums since 2011. All have topped the Billboardcharts in classical-traditional music. Their most recent effort, Lent at Ephesus, has spent more than seven weeks at No. 1. Their unlikely rise to stardom is the subject of a documentary that has aired on PBSstations in Kansas City and Chicago and will be shown in New York and other major PBS stations in June. Success came as a surprise to the sisters, but not the appeal of their music. The cuts on their CDs are a mix of ancient chants, hymns and plain song sung for centuries in monasteries. "I think there's a real hunger in souls for beauty, pure beauty. It's one of the most powerful means we have to communicate God," says Sister Scholastica Radel, one of the 21 mostly young sisters who live at the Priory of Ephesus, located about 45 miles north of Kansas City. Despite their growing fame, the sisters rarely speak publicly about their music. "As far as actual interviews and articles, we try to keep that out. I think it's better that way because then we don't think of the world as the audience, but God as the audience. That's why we came here." The music's prayerful quality is part of its attraction. "Some people say it calms their children, especially if they have children with disabilities. Some of the more beautiful stories have been about people playing our CDs for family members who are dying and finding solace that way, so there is something intrinsic to the music itself," Sister Scholastica says. Monasteries have been part of the religious landscape since the sixth century, and music has been integral to this way of life from the start. Increasingly, monasteries across the USA are sending their music out to the wider world. It is a form of music not easily replicated. "People who are singing the chant are people that sing together every day, and I think that is conveyed in the music," says Sister Susan Barber of Mount St. Scholastica, a Benedictine women's monastery in Atchison, Kan. "There is a oneness of spirit in the music. It is prayer." An increasing number of monasteries are preserving their music on CDs, often to commemorate a milestone in their history. Mount St. Scholastica recorded its music to give out as gifts to donors and friends in celebration of the monastery's 150th anniversary in Atchison last year. The Gower, Mo., sisters aren't the first monastic community to create a musical sensation. In the 1970s, a group of monks from Solesme, France, were among the first to introduce monastic music to a wider audience with an album of Gregorian chant recorded in the 1970s. In 1994, the monks of Santo Domingo de Silos, a monastery in Burgos, Spain, came out with Chant, a recording that sold 3 million copies worldwide. One critic at the time called the monks' music "a perfect antidote for the stress and anguish … of modern living." Ironically, it was a worldly concern that led the Missouri Benedictine sisters to record their music. They needed to pay off the mortgage on their priory, a handsome, two-story wood structure set amid rolling plains. They say they were praying to St. Therese of Lisieux for help when they received the inspiration to record their music. They recorded their first CD in their prayer chapel on their own rudimentary equipment and handed it out to benefactors. That effort, Advent at Ephesus, made its way into the hands of record producers Kevin and Monica Fitzgibbons, co-founders of DeMontfort Music. "We knew immediately the sisters had a lot of talent," Kevin Fitzgibbons says. It helped that Sister Cecilia Snell, the monastery's prioress, is a classically trained musician. She had played French horn with both the Civic Orchestra of Chicago and the Columbus Symphony Orchestra. Sister Cecilia had spent years fine-tuning the voices in her community to achieve the sound one reviewer has called "luminous." The Fitzgibbon husband-and-wife team brought in Grammy-winning producers to work on the sisters' two subsequent CDs, Angels and Saints at Ephesus and Lent at Ephesus. So far, the recordings have sold 135,000 copies, according to Monica Fitzgibbons. Neither Fitzgibbons nor the sisters will say how much money the sisters have earned from CD sales. But Sister Cecilia says her community is close to paying off its mortgage. Musical success hasn't altered their way of life. The sisters continue to follow the ancient Rule of St. Benedict, founder of Western monasticism. They rise at 4:30 a.m. and gather for community prayer eight times a day, singing hymns and chanting thePsalms in Latin. Most of their day is spent in silence. "Pray and work" is the Benedictine motto and the sisters grow much of the food they eat and raise milk cows. They also sew altar cloths and vestments for priests, an enterprise that kept them barely afloat before their CDs took off. "Did I ever think I'd be making a CD (at the monastery)? Not a chance," says Sister Cecilia, who had just bought a house and a new car and faced a promising performance career when she says she felt a call "in the depths of my heart" to enter religious life. Now, instead of playing French horn for audiences in Ohio, she says she and her monastic sisters are "singing for thousands of souls … bringing a little piece of what we believe heaven might be, that tranquility, to souls."